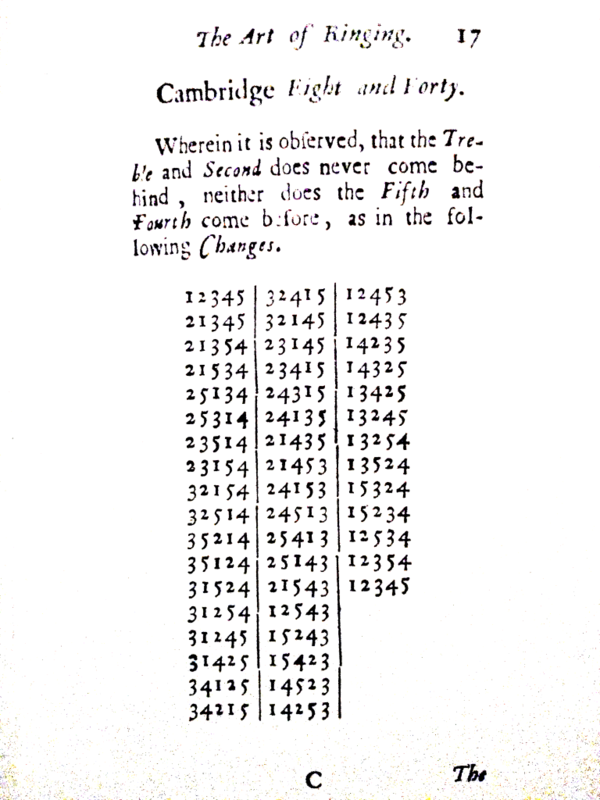 The first of Duckworth’s three “peals” is “the Twenty all over”. This is a simple but musically satisfying set of changes where each bell hunts in turn from the front to the back. There is a kind of repeating rotation of the melody as each comes into last place, which is upset again as the next leaves the front. He gives the verbal instruction that it can also be done in reverse, by hunting each bell down to the front instead. We do this one fairly often in St Salvator’s tower in St Andrews. The second is “An eight and forty”, which is harder to call and to keep track of. The fourth and fifth alternately hunt to the front, and an extreme change is made while they lead. Because they alternate in running in and back out, either the four or the five is always left in fifths place, which gives a curiously doleful effect to the music. We do this one less often just because it is slightly harder to ring. The third of Duckworth’s obsolete notations is “Cambridge eight and forty”. Unlike with the other two, he does not explain the method by which it is organised, just the notation of the numbers. And I have not yet managed to understand the method. John C. Eisel, in his chapter in Volume 1 of Change ringing the history of an English art (ed. J Sanderson, CCCBR 1987), says “the basic idea seems to be that while one bell leads for six changes, another lies behind for six changes, and the three bells in the middle execute the three possible changes, although the idea is not completely carried through”. Not completely – more like not very well at all, with blocks of five, and inconsistent switches on the front and back and opposite rotations of the middle sixes. 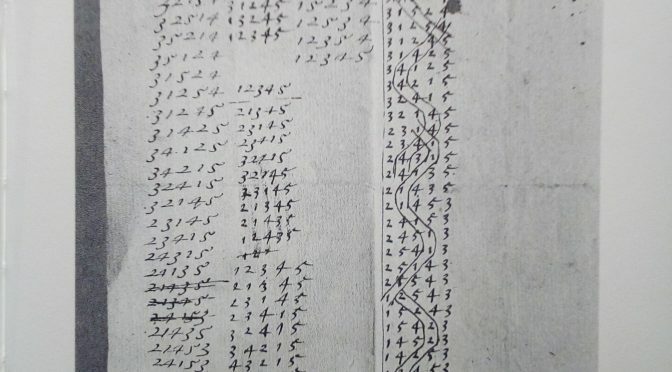 Eisel also reproduces an early 17th century manuscript which gives the Cambridge 48, and with the tracks of certain bells partially outlined a little like a modern “blue line”. but the tracks are incomplete, varying, and fail to highlight every point of importance. 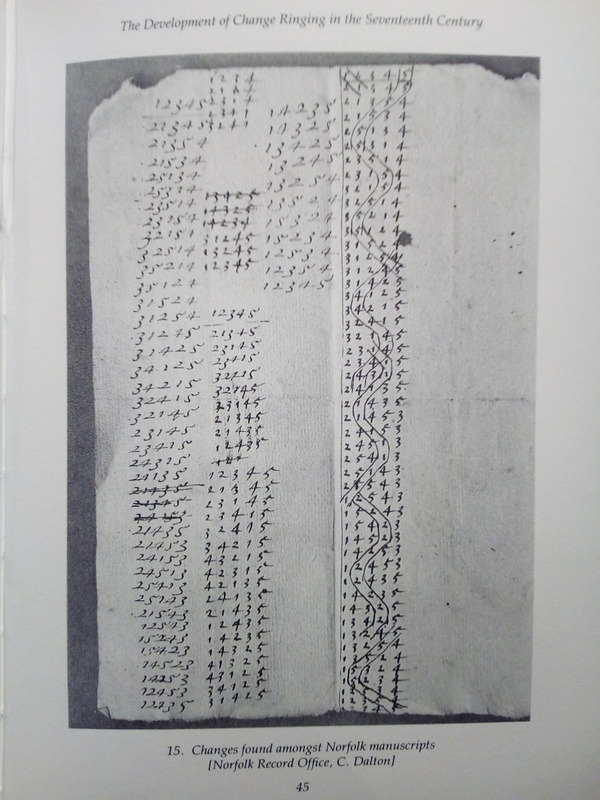 Paul Cattermole also reproduces the same manuscript page in his book Church bells and bell-ringing, a Norfolk profile (Boydell 1990, p.23). But he doesn’t have much to say about the actual method, talking about the manuscript and its writers instead. I did wonder if Duckworth had it garbled, but the Norfolk manuscript version seems to show they are genuine. Will the lines drawn on them prove useful for understading their structure? Or are they just like my scribblings on a photocopy of Duckworth’s page, vain attempts to “get” it? In the meantime here is my MIDI realisation. Each row is repeated twice, at a tempo of 120bpm, based on the comment in Stedman’s Campanologia (1677) p.4 “720 changes every hour”, i.e. 12 changes per minute. 11 strikes per change, is 132 beats per minute. I should do a blog post about performance practice implications of these throwaway comments in the two 17th century ringing books. Previous Previous post: Knowing about na comhluighe, but not using it?